Announcing The Winner Of Wise Investing Made Simple. 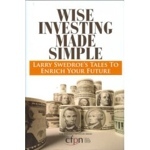 I started a book giveaway last week for my copy of Larry Swedroe’s Wise Investing Made Simple, and last night a random number generator (my wife) pulled a number and chose a winner of the book out of the 37 entries I received. Congrats to Valerie M. for being the winner! I will email you later today for your mailing information and will get the book out this week. If you did not win the book, do not fret, as I will be giving another personal finance book in a couple of weeks, so be sure to pay close attention! I will of course mention the details before the entries are accepted and will clue you in as to how we will work this next one. But again, it will be by a secret code word(s) within the RSS feed or email subscription, so be sure to subscribe today! And thanks to everyone who entered, and good luck in the next one!